Bradley’s 12½-foot Zenith Sector is famous as the telescope with which he discovered the two phenomena ‘aberration of light’ and ‘nutation’. Made by George Graham, it was commissioned by Bradley in 1727 for use in his uncle’s private observatory in Wansted (Wanstead) in North-East London. Bradley was appointed Astronomer Royal in 1742. When in 1749, he was granted £1000 to re-equip the Observatory at Greenwich, he used £45 of the money to formally acquire the Zenith Sector for use there. At Greenwich Bradley and his successors used it to check the line of collimation of the meridian telescopes. Between 1749 and 1837, a number of significant alterations were made to improve its operation. In May 1837, it was sent to the Cape Observatory for the verification and extension of La Caille’s arc of meridian at the Cape of Good Hope, returning to Greenwich in 1850 where it was hung as a relic on the west wall of the Transit Room in the Meridian Building. The telescope was taken down in 1952/3 for cleaning and conservation by the British Museum and the National Maritime Museum. It was one of the telescopes on public display in the Octagon Room in Flamsteed House when it first opened to the public on 8 May 1954. The instrument was formally acquired by the National Maritime Museum in 1955/6 (Object ID: AST0992). Following the refurbishment of the Meridian Building in 1967, it was moved to its 1779 position on the west side of the Quadrant Room where it remains to this day. It is one of the most historically important instruments on display. In 1725, James Bradley and Samuel Molyneux had been undertaking a series of observations in the latter’s observatory at Kew (in South-West London) in an attempt to measure the stellar parallax of the second-magnitude star Gamma Draconis (γ Draconis) which passed almost directly overhead (at the zenith). Their instrument was a 24½-foot zenith telescope by George Graham made for Molyneux specifically for this purpose. What they had hoped to be able to detect was an annual periodic shift in a north/south direction in the position of γ Draconis relative to the zenith as the Earth’s position in space changed during its orbit around the Sun. A commonly quoted analogy is the shifting in position against the background that occurs when an outstretched finger is observed first though one eye and then the other – the view of the finger from each eye being likened to the view of γ Draconis from the Earth when on opposite sides of its orbit. Bradley and Molyneux did detect a periodic change: but it wasn’t due to parallax. If it had been, theory dictated that γ Draconis would have been observed at its most northerly or southerly displacement from its mean position in June and December. What Bradley and Molyneux observed was a maximum displacement that occured three months out of step in March and September. The 24½-foot zenith telescope had been made so that it could only be altered in direction by 7 or 8 minutes of arc. This was perfect for its intended purpose of observing γ Draconis ... but it meant that very few other bright stars passed within its field of view. The series of observations could not therefore be extended to other stars to see if the observed phenomenon applied to them as well. Bradley therefore commissioned Graham to make another instrument; but this time one which could be swung by a few degrees to the north or south of the zenith allowing about 200 stars in the British Catalogue to be observed as well as γ Draconis. 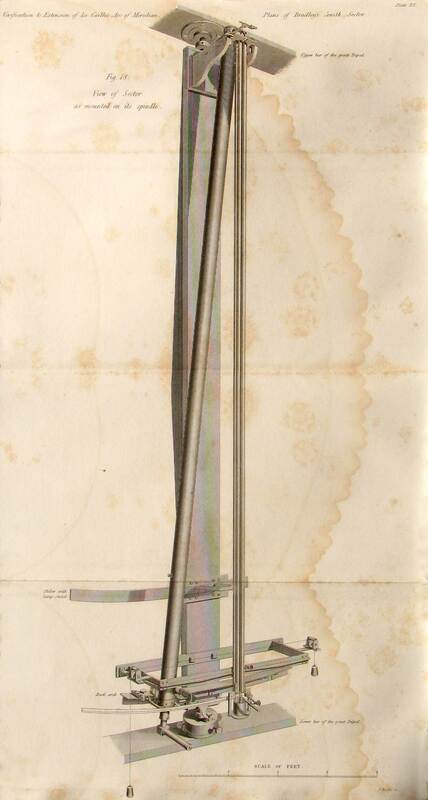 The length of the instrument and size of the swing were determined by the position in which Bradley proposed to mount the instrument at his uncle’s observatory in Wansted. The end result was a 12½-foot long instrument that could be swung pendulum like up to 6¼º to the north or to the south of the zenith. The new telescope was erected on 19 August 1727. Bradley found that all the stars he observed behaved in a similar way to γ Draconis. He eventually realised that what he was seeing was a result of the Earth’s movement rather than its position. The phenomenon became known as the aberration of light and was announced in a paper at the Royal Society in 1729. The observations also allowed Bradley to make an estimate of the speed of light. A detailed analysis of the apparent motion of the stars showed that as well as a shifting due to aberration, there appeared to be a periodic shifting due to something else a well. Bradley suspected that this was due to the pull of the Moon on the Earth – a wobbling of the Earth on its axis that we now call nutation. To confirm this required a series of observations to be made over one complete revolution of the Moon’s nodes … which meant nearly 19 years worth of observations. Bradley’s announcement of his discovery was published by the Royal Society in 1748. The following year, the instrument was moved to Greenwich. Following their discovery, both aberration and nutation were corrected for in the reductions of the Greenwich Observations. Gamma Draconis was later described by Airy as the ‘birth-star of modern astonomy’. Although the Sector was reckoned to be accurate to about one tenth of a second or arc, the distance of γ Draconis from of the Earth was far too large to produce a parallax capable of being detected. By comparison, the displacement that arose as a result of aberration was about 800 times greater. When in early 1749, Bradley managed to obtain a grant of £1000 with which to buy more instruments, he demolished Halley’s Quadrant House and erected a new larger building (now known as Bradley’s New Observatory) in its place. It was here, that the Zenith Sector was used at Greenwich. In June 1812, the 6-foot Mural Circle by Troughton was brought into use as a replacement for Bradley’s 8-foot Mural Quadrant. From the time of his appointment in February 1811 until the end of 1812, Pond undertook a series of observations of γ Draconis with both the Quadrant and the Zenith Sector in order to determine their accuracy before they were retired. Things did not however work out quite as planned; the Visitors having belatedly insisted that some sort of plumb-line be provided for use with the Mural Circle to determine the zenith point. As a result, Troughton provided a 9½-foot zenith tube (also known as the ten-foot zenith micrometer) to use alongside it. For various reasons, the new instrument proved unsatisfactory. According to William Pearson (1829) it was rapidly abandoned and Bradley’s Zenith Sector used instead. In about 1822 when the zenith point started to be determined by reflection observations made with the Mural Circle itself. The Zenith Sector was held in high regard by Airy, who having made certain alterations, sent it to the Cape in 1837. Click here to view Pond’s comments about the Zenith Sector and his published observations for the period 1811–12. Finding a detailed account of the instrument had never been written, and with the possiblity that it might be lost at sea on the way to the Cape, Airy persuaded the Admiralty to fund a draughtsman (Mr B Sly) to make a series of detailed drawings of it. These were published along with a detailed explanaition of the constructionin the first volume of Verification and extension of La Caille's arc of meridian at the Cape of Good Hope (1866). For completeness, Airy also researched the telescope’s history, publishing his findings alongside the drawings. A transcription of this is given below.
" In the year 1749, £1,000 was given by His Majesty, to be paid by the Treasurer of the Navy out of monies arising from the old stores of the navy (upon the representation of the Lords of the Admiralty, and principally upon Lord Anson's recommendation), to buy some astronomical instruments for the use of the Royal Observatory, when it was proposed by Mr. Folks, Mr. Graham, and Mr. Robins, who were consulted with on that occasion, that, in the catalogue of instruments to be purchased, a parallactick sector should be inserted as very useful for observing stars near the zenith; and the sector which I had formerly hung up at Wansted in 1727 (with which I had afterwards discovered the laws of the aberration of the fixed stars, as also the nutation of the earth's axis), being judged by them worthy of a place at the Royal Observatory, I removed it from Wansted in July 1749, and procured a new apparatus for suspending it (made by Mr. Hearn, as the old one was); and I likewise took care, while the rooms of the new Observatory were building, that there might be made convenient places for hanging the sector, both in the new Quadrant-Room and in the Transit-Room. My view (in providing for its suspension in either room) was to render it useful for settling the true zenith distances of such stars as come within its reach (or within 6¼° on either side of the zenith), thereby errors of the lines of collimation of the telescopes of the mural quadrants may be found with greater ease and certainty." I cannot extract this account without expressing my astonishment that no better method was devised by Bradley for reversing the instrument than carrying it from one wall to another. It appears probable, from an estimate cited by Professor Rigaud from Bradley's papers (Bradley’s Miscellaneous Works, p. Ixxvi. ), that the price of the sector was £45.
" 1750, Aug. 13. Examining the object-glass of the parallactick sector, I found that the screw (which should press it firm in the cell) was loosened, so that when I had pressed the glass down as much as I could in the cell, the screw had room to turn a great way before it touched the glass again. I therefore screwed it in as far as I could without injuring the glass, and then made a mark on it opposite to the middle of that end of the axis on which the plummet hangs, and so let it remain in that situation in order to find whether the line of collimation is altered by what I did to the object-glass; for I suspect that the difference between the zenith point, as found now and last January, may be owing to the glass not lying fixed in the same position in the cell. From the mean of all the observations, taken from Aug. 3 to Aug. 23, the zenith point of the sector is 38º 23’ 45’’, or about 1¼’’ different from what I before found in January last." "In these comparisons the zenith point of the sector is 38º 23’ 45.5’’. The angle shewn by the sector greater than that by the new quadrant 2.25’’ for every degree, and greater than that shewn by the old quadrant 1.25’’ for every degree, by the 96 division. The above numbers are the mean of the observations made from Aug. 14,1750, to October, 1752." Manuscript marked D. It is stated that, in January and February 1754, the zenith point was found to be 38º 23’ 45.35’’; the angle shewn by the sector, when in the Transit-Room, was greater by 2.6’’ in a degree than by the new quadrant, and by 2.1’’ in a degree greater than by the old quadrant with Mr. Bird's division ; and, when in the Quadrant-Room, greater by 2.3’’ in a degree than by the new quadrant, and greater by 1.5’’ in a degree than by the old. In September, 1754, the angle was found to be greater by 2’’ in a degree than that shewn by either quadrant. These numbers were found by comparing the zenith distances of stars several degrees apart, as found with the sector and with the quadrants (manuscript marked C). The following notes occur in Dr. Maskelyne's papers, and are for the most part printed in his Observations. 1768, July 12. [MS. No. 329.] " This day Mr. Bird set up the zenith sector of 12½ feet radius, which he has cleaned and put in order, in the Transit-Room. He has also altered the manner of suspension of its plumb-line, which before was hung from a notch made precisely at the centre of the instrument; but it is now suspended from a notch a little above the centre, and the notch is moved by means of a screw, so that the silver wire, which is the plumb-line, may appear through a microscope to pass over and bisect a fine point placed at the centre." 1776, Nov. 5. "Weight added to the plummet: it now weighs l½lb." " The western wall of the Quadrant-Room thus raised has been applied to good use, as a new place of support from whence to suspend the zenith sector, when removed from the eastern wall of the same room in order to be turned into a contrary position, instead of placing it on the western wall of the Transit-Room, which was less commodious, being at too great a distance from the mural quadrants." The brackets and the attachments for the back arch, for mounting the sector in its two positions, were in the Quadrant-Room (one on the eastern wall, the other on the western wall) till within a short time. They were removed on the occasions of converting the western side of the Quadrant-Room into a fire-proof-room (in 1839), and of making some alterations in the Computing-Room, which required the erection of a staircase and the piercing of new doorways on the eastern side of the Quadrant-Room (in 1841): the openings in the roof remain as they were.
" 1785. [MS. No. 329.] A steel arch with divisions to every five minutes of zenith distance upon gold pins has been substituted, instead of the brass arch by the late Mr. Sisson, so that now the instrument requires no correction, either for the total arc or for the different rates of expansion and contraction of the arch and telescope by heat and cold, as they are both made of the same metal. Moreover, the horizontal wire in the focus of the telescope has been sunk in a deep groove, that it may never touch the vertical wire, as was done with the wires in the focus of the transit and south quadrant telescope in 1784. A guard, also, has been applied to the plumb-line, to defend it from the impulse of the air, and the plummet-pot has been fixed to the guard, with a short broad plummet, that the observations may now be made, even in the zenith, without ever taking up the plummet; a circumstance which much facilitates the observing a number of stars in succession in the same night. 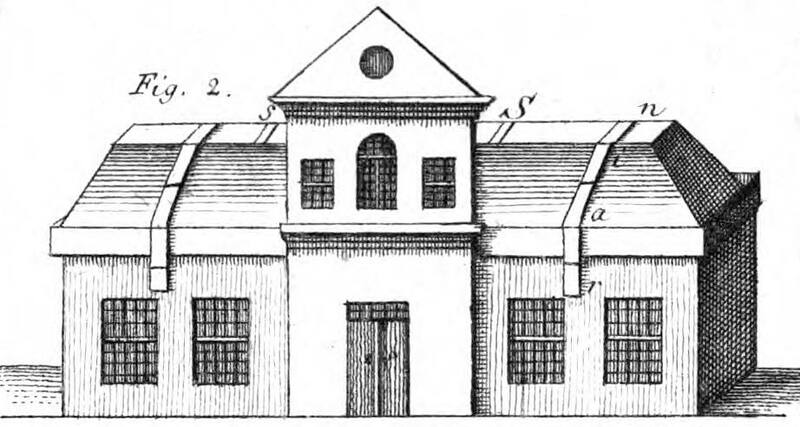 The placing the lamp for enlightening the wires at a much greater distance from the object-glass than formerly, as well as the enlargement made in the opening of the roof in 1779, cannot but conduce to the greater exactness of the observations." The name of the artist who constructed the new arc is not mentioned; but from the next entry it appears beyond doubt that it was Troughton. This is the arc which is still on the sector. The illuminating apparatus here described as new is probably that now used; the old one being probably a small disk in front of the object-glass.
" 1785, Nov. 19. The plummet of the zenith sector weighed 9¾ [ounces, I suppose]. The plumb-line broke in air with 19 5/8 ounces. I took out 1 5/8 ounce, to reduce it to 18 ounces. Mr. Troughton soldered lead on the inside to make it weigh exactly 18 ounces." "An excellent achromatic object-glass, with an aperture of 3½ inches diameter, has been fitted by Mr. Dollond to the same tube, instead of the original one of the common sort, and of about 3 inches longer focal length; and the finest wires of about 1/1000 of an inch in diameter fixed in the focus, instead of the former ones of about 1/500 of an inch. The same eyeglass is retained as before, for the convenience of observing, with the plumb-line always remaining in its place, stretched by the plummet immersed in water. The telescope magnifies about seventy times, as before. The thickness of the gilt silver wire plumb-line is 1/218 of an inch, and it is stretched by a weight of 18 ounces, as before." This is the object-glass now in the sector. The increase of focal length explains the insertion of the tube in the object end of the telescope, exhibited in fig. 6. The method of using the sector has always been the following:– Direct the telescope to the expected place of the star, and clamp the slider (fig. 16, &c.) By means of the adjusting piece seen in figs. 3, 4, and 5, cause the plumb-line to pass truly over the upper dot. Then, if there is sufficient time before the star's entry into the field, use the micrometer-screw (fig. 16, &c.) to make the nearest dot of the limb pass under the plumb-line, and read off its number of turns and subdivisions. When the star enters the field, use the same micrometer-screw to make the wire in the field of view bisect the star. The difference between the two readings is evidently the quantity, which must be added to or subtracted from the reading expressed by the graduation of the dot, to give the star’s zenith distance, still subject to an error of collimation, which will be eliminated by reversing the instrument. If time permit, it is prudent again to read the micrometer with the dot under the plumb-line, as the observer will thus ascertain the firmness of the slider-clamp during the observation. In judging of the merits of this instrument, it must be remarked that, in common with all other instruments of the same class, it is liable to one of these inconveniences; that, if the plumb-line hangs at a sensible distance from the limb, it is difficult, without very great care, to pronounce on the bisection of the dot on the limb by the wire; and if it hangs very close to the limb, there is danger of derangement to its position by scraping on the limb. The adjustment for distance of the limb from the plumb-line is made by the large screw seen in figs. 8, 9, and 14; and can undoubtedly be made with great delicacy ; but if the tube be not sufficiently bent by the action of this screw, the bearing upon the Y's in figs. 3, 4, 5, will be disturbed, and it will be necessary to adjust the foot-screws of the triangular frame. Moreover, in common with all other instruments of the same class, it is liable to this inconvenience, that it is impossible to ascertain with it the zenith distances in both positions of the instrument on the same night; and it would, from this cause, be liable to inaccuracy if there were any sensible change, either in the relation of the upper dot to the object-glass, or in that of the limb to the eye-piece-wire. Against this latter defect, perhaps, it may be considered as secured in a great measure by the general excellence of its mechanical connexion. On the whole, I have no hesitation in saying that, though I do not consider the instrument as faultless, I esteem it as one of the best specimens of a very admirable class. Prior to sending the instrument to the Cape, Airy had it checked over and slightly altered. This is his description of what was done and why. The instrument, when at Greenwich, was suspended to a bracket fixed to the wall of the Quadrant Room; and there was no means of reversing it in azimuth, except by taking it down from that bracket and carrying it to another bracket on the opposite wall of the same room: an operation which, as I am informed by Mr. Henry (the only assistant now at the Royal Observatory who remembers its use), occupied a whole morning. When the instrument was prepared for use at different field-stations at the Cape of Good Hope, a new cast-iron bracket of smaller size was made, and was attached to a vertical spindle turning in azimuth within a large tripod-stand; upon this bracket the brass work was mounted in exactly the same manner as upon the original brackets. To the lower part of the spindle an iron bar was screwed, for attaching the ends of the brass frame that carries the weight-pulleys and steadies the plumb-line shade (which frame was formerly attached to the wall); and also another iron bar, for supporting the back arch by means of two flat horizontal pieces, with long screw-holes, that project backwards from the back arch. A wooden sliding arc of a circle, carrying a flat board for a lamp-stand, was placed on the spindle opposite to the illuminator of the telescope. A four-glass diagonal eyepiece was made: the original eye-glass being a single lens. These are all the changes made under my direction. The object-glass, whose convex lens is thin, was found so much pinched in its cell that the coloured rings were exceedingly distorted. It was relieved. The image of a star, as now shewn by the telescope, is extremely neat. The whole of this work was done by Mr. Simms in the summer of 1837. Bradley’s Zenith Sector. Detail from a drawing by John Charnock c.1785. Reproduced under the terms of the Creative Commons Attribution-Non-Commercial-ShareAlike (CC BY-NC-SA) licence courtesy of the National Maritime Museum, Greenwich, London. Object ID: PAF2940.